The smell of fresh-baked bread is one of the best that I know (along with bacon and fresh-ground brewing coffee). I cannot think of anything much more pleasurable than hot, fresh bread with butter and maybe some exquisite (unprocessed) raw honey. I’ve found that even when cooking for one on a busy schedule it not impossible to bring that wonderful taste and aroma into my kitchen with a minimal investment of time. Buying bread from the bakery is fine, but for me, I keep ending up with stale bread. I can make bread crumbs for later use, but that fills my freezer with more bread crumbs that I’ll ever need. I could freeze part of the bakery loaf, but even though that helps, it’s still not the same as fresh bread from the oven. I’ve baked bread the usual way: proofing, letting it rise, punching it down, letting it rise…successfully. I put small loaves in the freezer, and as long as I remembered to pull them out to defrost in the fridge over night, I could have fresh bread with minimal effort and in quantities appropriate for one person. That was fine when I was a telecommuter; I could use my breaks to knead the bread, and take the few minutes necessary to pop it into the oven. I had my small loaves; but, I had to remember to defrost it. When I was no longer a telecommuter, that did not work quite so well, so when I heard about the dough being kept in the refrigerator, I had to try it. The no-knead, wet-dough technique described in Artisan Bread in Five Minutes a Day by Jeff Hertzberg and Zoe Francois lends itself admirably to cooking for one. I was skeptical when I first heard about this, but since I love good, fresh bread, I bought the book and gave it a try. 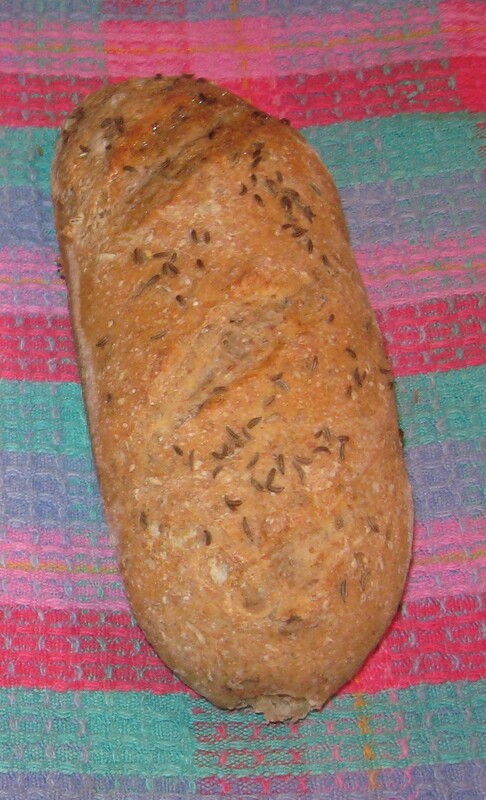 It has made fresh bread for one an easy thing to do. When I’m in need of an attitude adjustment, nothing does it better than to go into the kitchen and with minimal effort have my home smelling of fresh bread. The main attraction of this method for me was that the dough could be kept in the refrigerator for about two weeks (less for dough enriched with eggs). I can reach in and grab a handful of dough, form a small loaf, let it rise (shorter time for small loaf), and bake. The hands-on time is minimal. The results are wonderful. To give you a sample, here is an adaptation of the Master Recipe a free-form boule from Artisan bread in Five Minutes a Day. For measuring the flour, just dip and then level your measuring cup with a spatula (scoop and sweep)–no sifting required. You can bake this on a cookie sheet, but if you really get into this, you will probably want to get a baking stone, but even baking on a cookie sheet, you have some good bread. Be sure to use dry-ingredient measuring cups for the flour. I assuming that you likely don’t have a stand mixer or a large food processor, so I’m given the hand mixing instructions here. I think that the only “tricky” part is shaping the loaf; not having the pictures in the book, here is a link to a video which will show you the mixing and shaping technique. Add yeast and salt to the lukewarm water in a 5-quart bowl or lidded (not airtight) container. Mix in the flour all at once with a wooden spoon. If the mixing becomes too difficult with the spoon, use your hands (wet) to work in the flour, but do not knead the dough. Now, allow to rise at room temperature (covered) for about 2 hours until the dough as doubled, or starts to collapse (flattens on top). Refrigerate the dough overnight since it’s easier to shape the loaves with cold dough. When you’re ready to bake, prepare you cookie sheet, or parchment paper with a light sprinkling of flour or cornmeal. Now, sprinkle a bit of flour on the surface of the dough and pick up a handful (about grapefruit-size for a one-pound loaf). Sprinkle with flour and shape, as if you were pulling a blanket from the top down around it to the bottom side. Don’t knead–this shaping should take only about a minute. Place the loaf on cornmeal on the cookie sheet or on parchment paper, and let it rest for about 40 minutes for the one-pound loaf. Preheat you oven to 450 ° F with the rack in the middle of the oven. After the bread rests for 40 minutes, dust the top of the loaf with flour. Using a serrated knife, slash a 1/4-inch deep cross on top so that you control how the crust breaks open when it expands in the oven. The crust will be best if you use steam in the oven; you can do this by using the broiler pan on the lower rack, and pouring in a cup of hot tap water when you put the loaf in to bake. Baking will take about 30 minutes, or until the crust is brown. Store the remainder of the dough in the refrigerator until you’re ready to make another loaf. I started with the master recipe, and have now worked my way through a number of others: deli-style rye, brioche, chocolate bread (yum), brioche filled with chocolate ganache, the Portuguese broa (a corn bread–great for the Thanksgiving holidays), olive oil dough, and others. Every recipe has worked as it should. It’s great to be able to make myself a crusty baguette one day, and a boule, or sandwich loaf the next time–all from the same batch of dough. Since I use some bread for sandwiches, I frequently bake mine in an Italian bread pan which lets me have an oval loaf , larger than a baguette, that works well for the kind of sandwiches I make. This pan is perforated so you get a better crust than using a non-perforated pan. The pan is nonstick, but with the wet dough you will still need to us a cooking spray to prevent sticking, and the dough will ooze into the perforations sightly, but it can usually be removed easily. The container that I use to hold my dough is a Rubbermaid that I got from the grocery store. It has a good lid, and is not airtight. If you are hand mixing you could , just mix in this container. The corners are slightly rounded, but I find it’s difficult to get all the dry flour mixed around the edges, so I usually mix in a bowl and transfer the dough into this container. If the lid on the container fits very tightly, you will need to leave it loose of because of the gases that are formed during the fermentation. Of course, I was excited when the second book, Healthy Bread in Five Minutes a Day appeared. I’ve just gotten the Kindle version of that one, and anxious to try some of the recipes there. I’ve been interested to see comments about this technique on other blogs. An adaptation of the master recipe for whole grain bread can be found on the Former Chef blog, along with some helpful photographs that should make you want to run to the kitchen and bake. I intend to take this evening to peruse this book and see what gems I can find. To be on the safe side, I’ll start with the master recipe to see how the dough handles. Based on my previous experience with these recipes I’m expecting great things. More recipes and baking tips can be found in Zoe Francois’s blog, Zoe Bakes. New recipes and tips are available at Artisan Bread in Five website as well. I’m hooked on having fresh bread in such an easy way. The loaves in the photograph are brioche just out of the oven. If you really need an attitude adjustment, the smell of the brioche (especially when filled with chocolate ganache) will definitely do it! More about brioche coming soon. Happy baking! HOW DO YOU GET LARGE HOLES AND OPEN CRUMB ITALIAN LOAVES W/O LOAVES SAGGING INTO FLAT BREAD??? The level of hydration can affect the openness of the crumb–usually wetter dough will give a more open crumb. If the bread is sagging or flattening, I would wonder if it’s being allowed to rise too long, or if you need higher gluten levels. Are you using all-purpose or bread flour?